I awoke to tiny snowflakes swirling around in a rather aimless fashion. They didn't settle in Ashburton, but when we got to Spitchwick there was a lovely white dusting, a strong contrast to the dark snake of the river running through. It was so cold outside there actually wasn't much of a shock getting in to the water, which Judy's watch said was 1.7 degrees C. As I started to swim, trying to suppress the urge to scream violently, I started to feel the familiar and strange pleasure/pain of a thousand needles attacking my limbs, and then a burning sensation on my skin. I know it sounds mad, but this is actually incredibly invigorating - the perfect way to start the day, especially when rounded off with a tot of my new favourite post-swim tipple, spiced rum. Later we went on a walk to Foggintor Quarry, where I've swum in the past, it was transformed into an ice lake, absolutely beautiful. 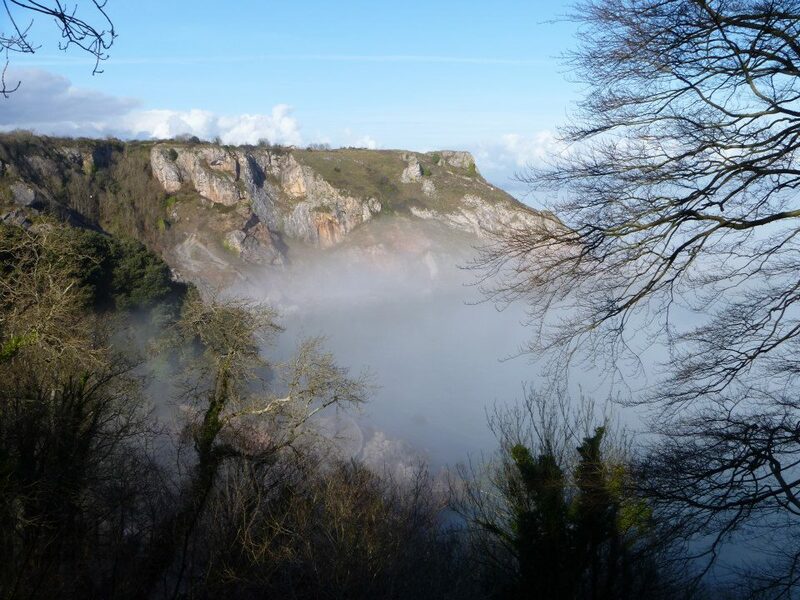 Anstey's Cove is mysterious at the best of times, but when wreathed with fog it is positively eerie. We climbed down over the rocks and got into the beautiful green water; Allan and I swam over to look at a cave which is hidden behind rocks on the other side of the bay. 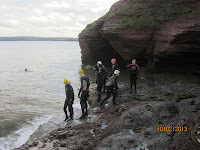 I was in two minds about swimming over as it was some distance and the water felt very cold, but I was driven on by my desire to see the cave. We kept going, passing some divers' floats, though we didn't see the divers. By the time we got there we felt too cold to risk exploring and had to be content with a tantalising glimpse of the cave with its inner pool. 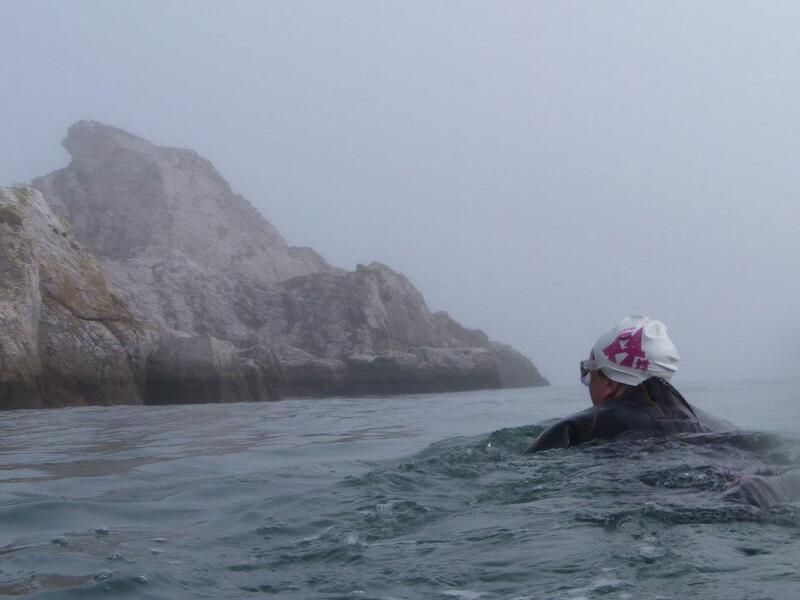 I felt anxious swimming back, worried about keeping going against the cold; in the end we were fine but the worry hampered my enjoyment of the swim. A lesson learnt I think. 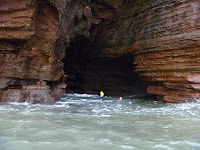 There is a set of spectacular sea caves in Torquay which the writer Charles Kingsley (author of the Water Babies) described as 'a labyrinth of double and triple caves, like Hindu Temples". 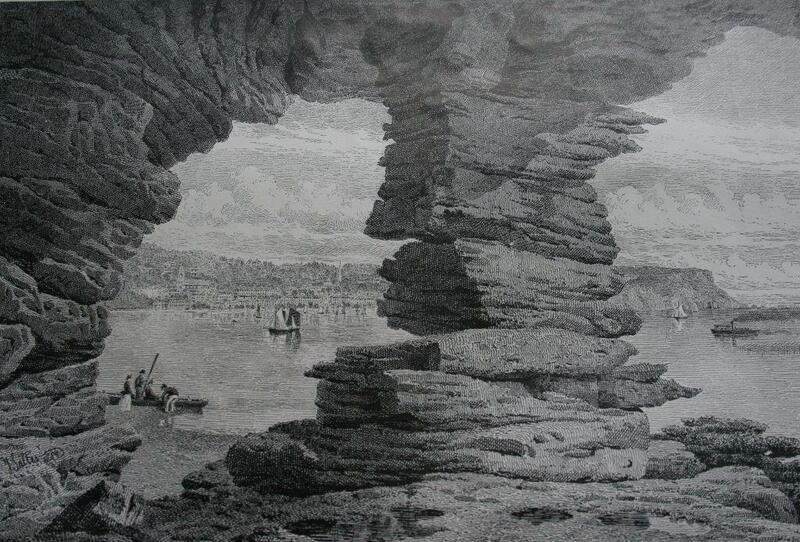 In Victorian times, as this etching shows, they were quite well known, but now it seems they are largely forgotten, even though they're just minutes from the main road. We set off in rather murky, unattractive seas, and there was quite a swell. 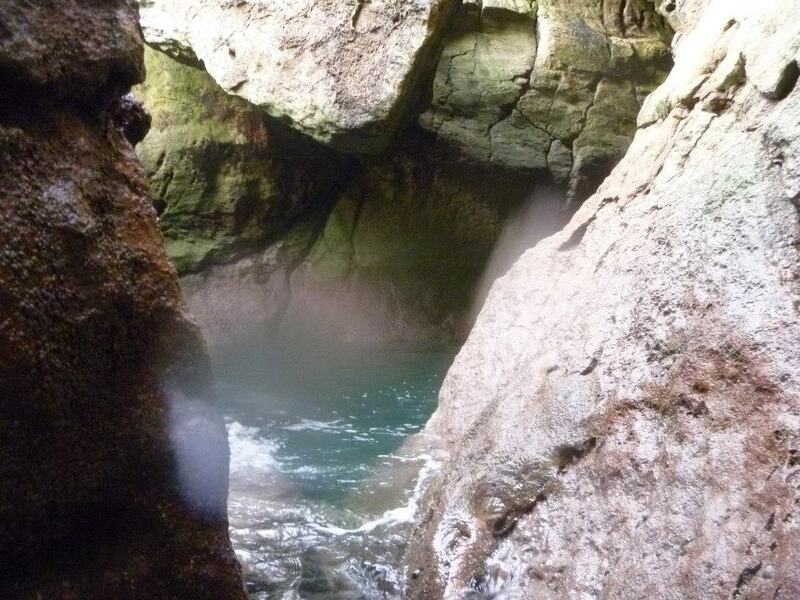 The water rushed in and out of the caves, crashing against the back walls and creating rough swirls and eddies. It was very dramatic but it made it difficult to explore safely although some brave souls ventured in, where they were whirled around before being unceremoniously spat out. 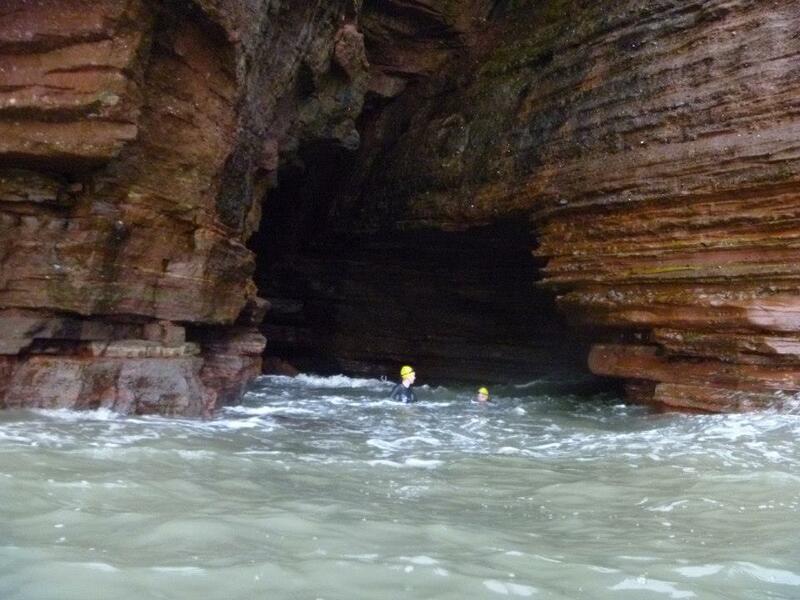 As the sun started to set behind the headland, and the sea roared inside the caves, it felt like an amazing place to be. Thanks to Allan and Pauline/James for the pictures. This weekend I felt the glimmerings of hope that Spring is not far away. We headed for Ayrmer Cove, a tucked away beach with striking slate cliffs that are so flat you could do your sums on them. As we approached the sun glinted off the slate, in fact everything was drowned in bright, bright sunlight, so much so we felt like moles emerging from underground. The beach was full of beautiful grey pebbles and masses of flotsam and jetsam. The plan was to swim round to the next beach, Westcombe Cove. Allan, Rachel and Stephanie did some, ahem, 'aquatic pilates' and then we set off and were quickly pulled out by a current; Allan and I kept near the coastline while Hugo, Stephanie and Jonathan were soon little blobs out in the open sea. We squinted in the sun as we watched them swim, and then realised we could see Burgh Island over to the left. We approached Westcombe, but decided not to swim all the way in to the beach, as we could feel it would be hard going. On our way back Allan and I kept dodging some rather deceptive waves that kept sneaking up on us; even when in our depth it was a tough swim back in, going against the tide.